Bath had an awful season last time out only managing to finish 9th in the Premiership a poor return having made the final in the 2014/15 season. There is a sizeable number of international stars at the Recreation Ground and the squad looks strong if not that deep. The only worry for Bath is the hole left by the departures of Kyle Eastmond and Ollie Devoto in the midfield leaving Dan Bowden and Jonathan Joseph as the only senior centres in the squad. Joseph on the attack for Bath. The Recreation Ground has become accustomed to an attacking gameplan executed with fluency and pace as we saw the season before last. A devastating three quarters is lethal when given space. 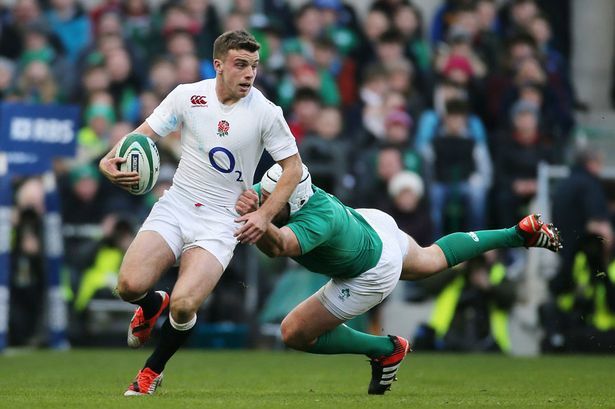 The whole operation kick started and led by fly-half, George Ford. One of the only positives from last season came in defence, despite finishing in 9th Bath was among the best defences in the Premiership when it came to conceding tries. Whilst Bath leaked penalties for the most part teams found it hard to break Bath down. The Bath out half is a real talent and he suffered last year low on confidence and bereft of inspiration the backline faltered. Then in Australia he showed us the player he really is with a pack going forward and with none of the focus on his kicking he flourished. 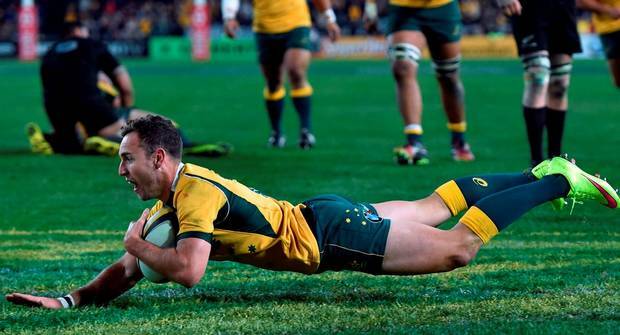 Ford is the best attacking fly-half in the league without a shadow of a doubt. There were question marks over his defence but the doubters have now been silenced after a string of important defensive display notably the first test in Australia. Another of Bath’s England contingent. The outside centre has treated us to some moments of sheer brilliance. His dazzling footwork and trademark outside arc make him one of the most devastating strike runners for Bath. What tends to go unnoticed is his defensive work rate, he doesn’t shy away from the less glamorous jobs. He will be key for Bath this season. This man is amongst the best opensides in the world as he shows time and again for the Springboks. His southern hemisphere mindset of how the breakdown should be controlled is perfect to provide Bath’s backs quick ball. Louw is bound to get his plaudits again this season and when he returns after the November internationals it will feel like a completely different team. The capture of Wales duo Faletau and Charteris is a huge coup for Bath further bolstering Bath’s impressive back five of the pack. Samoan international Fotouali’i is a good addition, he has serious pace and can act as another playmaker. The loss of Devoto is huge, he along with Eastmond leave a void for Bath to fill. Losing Houston to Super Rugby is also a shame, the fan favourite was an effective carrier. Hooper ends his career, he will remain at Bath in a coaching capacity. Bath definitely have the quality of player and coach needed to succeed at Premiership level but this looks as a season for building and establishing goals for the coming seasons. This entry was posted in Uncategorized and tagged attack, bath, blackadder, bowden, charteris, crusaders, devoto, eastmond, England, faletau, ford, fotouali'i, hooper, houston, joseph, louw, matson, mercer, midfield, penalties, rec, samoa, the recreation ground, wales, watson. Bookmark the permalink. England had a tough World Cup campaign and it finished with flattery against Uruguay as a stale performance saw England win 60-3, a flattering scoreline for the host nation. 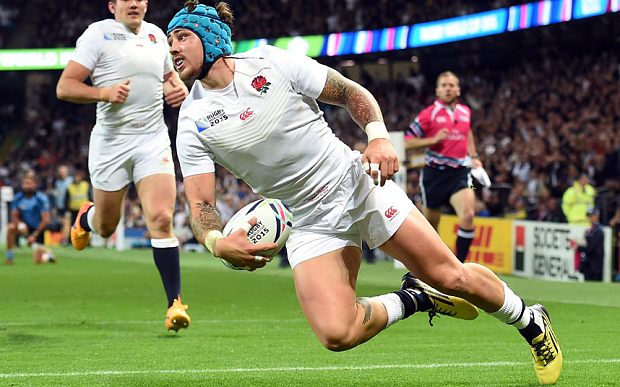 Jack Nowell crosses the line for one of England’s 10 tries. The performance though did have some pleasing elements, for one the performance of Exeter’s playmaker Henry Slade who has been unbelievable for his club and it is a mystery as to how he has been overlooked until England’s final ‘dead rubber’ as it were. Slade’s passing and running game was quite something to behold and outside Ford who finally got his chance once again was good with the ball in hand if he did falter off the tee. Henry Slade scores for Exeter against Harlequins. Farrell kicked well as he always does, a masterful display of kicking. Joseph’s introduction saw England change, the midfield now looked sharper and an unbelievable piece of inspiration from the Bath centre set up Watson’s 2nd try against the minnows. Joseph’s pace and feet make him a real threat and it is a shame we did not get to see more of his dazzling skill in this World Cup. Another player who looked good was the Saracens fullback, Alex Goode, he has had no chances in this World Cup despite a stellar season for the Premiership champions. He added a playmaking option to the midfield already laden with Ford, Farrell and Slade. England showed some sort of attacking intent and hunger which had not been seen against Wales or Australia. Some flair, bravery and guile, a hunger to win and win well. They looked in control with flowing passing, good running lines and a couple of wonderful tries. The performance had it been against any of the other top teams in the world would have been a horror show but the glimpses we saw of Ford and Slade combining along with the magic from Watson, Joseph and Nowell may well have been the dawn of a new English backline. Anthony Watson in action for Bath. Forget the power based game, England need a team that can attack, so Manu Tuilagi and Luther Burrell are good players. But what would you rather England produced a crash up the middle or scything breaks round the outside? I know what I would rather watch, I may be slightly biased but after witnessing some amazing backs interplay last night I think it’s clear which way England must go following this World Cup’s conclusion and the likely resignation of Lancaster. The forwards need a complete reshuffle and need a nasty streak, something that other teams fear, they need to emulate the fear factor Johnson, Dallaglio, Vickery and Back provided in 2003. England have some of those figures ready to step into the breach. They need their scavenger, the Toulon exile Armitage, they need to find a way of bringing him into the squad without seeing an exodus from the Premiership. Burgess is a back row and he can be played there England need to address that as well. The back row has been a real point of weakness for the last 4 years. The coaches all need to go, Lancaster has failed, Rowntree’s scrum has been bullied by Australia, Wales and France, Farrell has been involved in refereeing disputes and there is the obvious nepotism claim (which has been heard loud due to rumours of Ford, Slade and Goode running rings round Barritt and Burgess) and Catt’s bust up with Cipriani leaves him out of the set up. Rob Andrew and Ian Ritchie also have to call time on their stays at Twickenham, they have to leave and England have to bring in Sir Clive Woodward as a Director of Rugby, he is the only man for the job a sentiment echoed by Dallaglio. England have deep rooted problems that must be sorted out there is a long list of people to shoulder some of the blame but last night we saw a glimpse of a brighter future. That brings both a balance and some excitement along with some nasty forwards, this is of course if form is the same as last season only time will tell. This entry was posted in Uncategorized and tagged 2003, alex goode, armitage, australia, back, barritt, bath, dallaglio, England, exeter, france, george ford, gloucester, graham rowntree, harlequins, henry slade, hosts, jack nowell, jonathan joseph, lancaster, leicester, martin johnson, mike catt, northampton, owen farrell, premiership, ritchie, rob andrew, rugby, sale, sam burgess, saracens, toulon, uruguay, vickery, wales, watson, World Cup. Bookmark the permalink.